202 pages | 5 B/W Illus. Drawing on case studies, this book illuminates a diverse range of nonformal education activities; and suggests that the nature of the relationship between nonformal education and mainstream schooling has changed. Not only have the two sectors become more interdependent, but the formal education sector increasingly acknowledges nonformal education’s important and necessary roles. These changes signal a significant departure from the past in the overall functioning of Japanese education. The case studies include: neighbourhood homework clubs for migrant children, community-based literacy classes, after-school care programs, sport clubs, alternative schools for long-term absent students, schools for foreigners, training in intercultural competence at universities and corporations, kôminkan (community halls), and lifelong learning for the seniors. 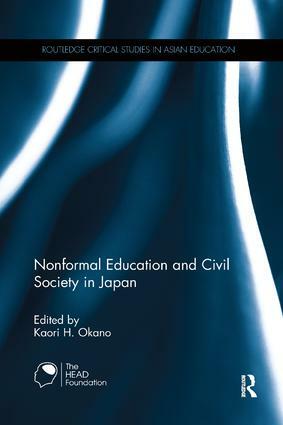 This book will appeal to both scholars of Japanese Studies/Asian Studies, and those of comparative education and sociology/anthropology of education. Kaori H. Okano is Professor in Asian Studies/Japanese, School of Humanities and Social Sciences, La Trobe University, Melbourne, Australia.